Michael graduated from the University of Michigan with a B.A. in Psychology in 2005. He then became an Artillery Officer in the United States Marine Corps and was first stationed in Okinawa, Japan. After a deployment with 1st Group to the Philippines, Michael returned to Fort Sill, OK to serve as a Fire Support Instructor. 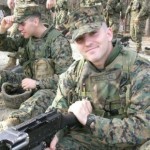 After working as a staff planner at CENTCOM, Michael began his transition out of active duty. Michael is a member of the Kellogg School of Management’s class of 2017 and is a drilling reservist with 3d Civil Affairs Group in Great Lakes, IL.